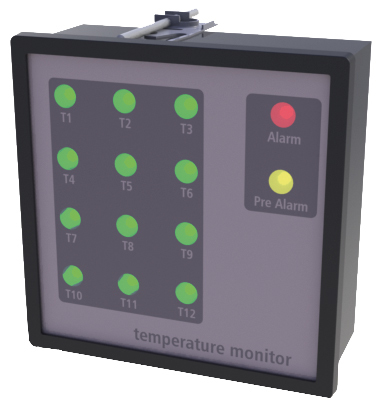 Non-contact temperature monitoring is an essential tool for ensuring the safety and reliability of equipment. As alternative solutions to portable thermal imagers, both portable and fixed infrared thermometers are gaining importance in preventive maintenance applications, the latter for example in OEM solutions and for the infrared monitoring of large plants with a multitude of measuring points. The detection of defects in switchgears, fuses, motors or electrical connections is almost impossible with the naked eye. But we do know that almost any electrical device will get warmer than normal very soon after an anomaly occurs. In complement to portable thermal imagers, high-end portable infrared thermometers are now increasingly used for the detection of weak spots. Fixed pyrometers are used predominantly in plants where electrical or mechanical components to be monitored are hard or impossible to reach. The handheld infrared thermometer optris LaserSight LS enables you to verify critical components quickly and easily once you have identified them by means of a thermal imager. This gives you fast inspection capability for temperatures from -32 to 900ºC. The integrated laser sight with crosshairs permits accurate targeting of the measured object and indicates the real measurement spot size. At the touch of a single button the temperature reading appears on the display with a 0.1ºC resolution. An alarm signal is output to indicate temperatures above or below programmed limit values (MAX/MIN function) so that you can systematically scan the measured object and quickly pinpoint the source of the malfunction. One major aspect to be taken into account for all measurements is whether the optics of the infrared thermometer actually are able to acquire the hot spots properly. The optical resolution offered by commercially available infrared thermometers in the low price range is poor, and the dot laser featured by such instruments can be used for sighting only but doesn’t represent the true measurementspot size. As a consequence, the temperatures readings for overheated objects are lower than their real temperatures. So if, for example, a small electrical component experiences an overload condition and heats up excessively, this will only show as a minor temperature rise if the measurement spot is too large, so that potentially hazardous situations will go undetected. Figure 1 shows a correct temperature measurement procedure using the laser/crosshairs technology for monitoring of components in a switch cabinet. The new two-lens precision optics of the optris LaserSight LS permit the measurement of very small objects. Switching to the Close Focus Mode enables you to accurately measure targets as small as 1 mm. Sighting is provided by two laser beams intersecting at the close focus point at a distance of 62 mm. So far, instruments available on themarket have been designed either for longer measuring distances, or exclusively for small measurement objects. This forced customers to buy either several thermometer models or replacement optics. The optris LaserSight LS is an all-in-one instrument where you simply flip a selector switch for close focussing. In plants which are very expansive or comprise hard-to-reach electrical or mechanical equipment (large production facilities, high-rise buildings, shipboard systems etc.) the use of portable instruments is very time-consuming and labor-intensive. Also, such inspections can never be more than random spot checks and will only permit the detection of trends. Near-absolute safety can only be offered by a fixed system providing full-time continuous monitoring. The fixed pyrometer optris CS has been specially designed for maximum versatility and is used for example to monitor shipboard electrical systems for loose bolted connections. Defective busbar and power breaker connections lead to increased contact resistances, causing overheating at these points. Fixed pyrometers are an affordable solution for the monitoring of large numbers of such critical points. If temperature limits are exceeded an alarm signal is output to the control unit. This allows overheating conditions to be detected quickly and reliably and the electrical system to be cut-out instantaneously with very short response times (less than 1 second). The optris CS measures temperatures from -40 to 1030°C, being only 87 mm long and 12 mm in diameter it can be installed in confined spaces and tolerates ambient temperatures up to 80°C. It is attractively priced and combines excellent quality and high measuring accuracy with a rugged, superior mechanical design. It has been designed for deployment in harsh industrial environments and ensures very good electromagnetic compatibility performance. The electronics package is integrated in the instrument together with an intelligent sighting aid. It also features a scalable analog output (0 - 10 V or 0 - 5 V) and protection against short circuits and polarity reversal. The optris® TM (temperature monitor) has been developed for temperature control applications with optris CS infrared thermometers. It visualizes different sensor conditions of up to 12 measuring points and evaluates alarm and pre-alarm. The alarms can be directed analog to the process control.